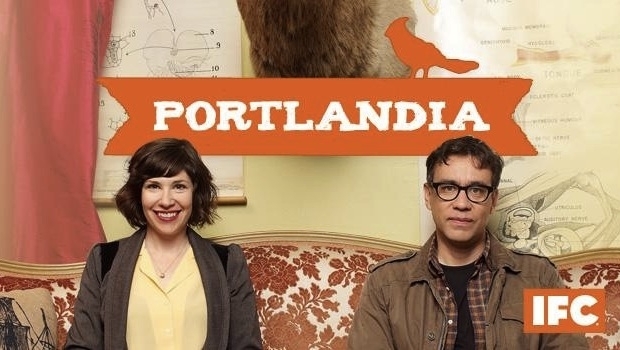 When browsing NYCGo.com last weekend, I noticed an event for Portlandia fans: A Conversation with Fred Armisen and Carrie Brownstein. There were still several seats available on the 3rd row! I immediately bought 2 and went there last Tue night with Wen. We both love this show a lot, maybe because it was the first sketch comedy we watched? (For Chinese readers, 万万没想到 might be the closest thing to sketch comedy among well-known Chinese TV shows.) But I tend to think we are just fascinated by the talents of the 2 creators. The stories are all set in Portland, a faraway small city illustrated as sort of a Utopia with nice but a little weird people. They play these stories in extremely exaggerated and funny ways that can make us laugh a lot and not feel bored or stupid at all. Actually you see some sort of wisdom in it. I talked with a few friends about this show. They are usually curious after hearing me describe one or two clips. But not everyone will like this show after watching one or two episodes. It’s really up to personal tastes. You can watch this show on Netflix. I’m not aware other ways to view it online. The event we went to was a chat show. Pretty nice. The seats we got were incredibly good. And it was truly an exciting moment when Fred and Carrie walked in and we saw them in such a short distance. Both looked fabulous, especially Carrie’s nice legs (Wen and I both noticed this, much better looking than on TV). It was quite entertaining to know how much improv were in Portlandia and how they see their own works. “Backstage stories” are always appealing to fans, aren’t they?